Tonight’s Black Tie Smoker will be held in Pembroke’s Old Library. The Old Library is the first building on your left when you enter Old Court (opposite the Porters’ Lodge). The room was built in 1355 for use as a chapel. It was the first college chapel in Cambridge (students had previously worshipped at local churches), and required a Papal Bull to establish. All of Pembroke’s original buildings – chapel, hall, kitchen, and lodgings – were built around a single court, now called Old Court. 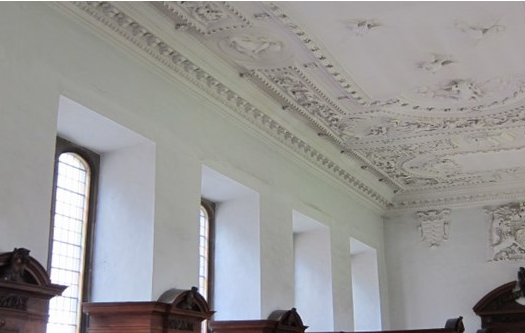 In 1665, the current college chapel (Sir Christopher Wren’s first architectural project) was consecrated on the opposite end of Old Court, and this room became the college library. In 1878, a new Library was completed by Alfred Waterhouse on the east side of the college, hence the room’s current moniker of ‘Old Library.’ It has a striking seventeenth century plaster ceiling, designed by Henry Doogood, depicting birds flying overhead. For more on the history of the college, visit the college website. See you there at 8pm!